Teeth bleaching by cosmetic dentist Dr. Robert Thein is a quick and inexpensive way to a beautiful smile. There are two popular teeth-bleaching techniques. One option, Zoom Whitening, is done in the dental office. This is the fastest whitening technique, but it is also our most expensive option. 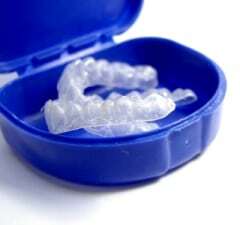 Whitening can also be done with a take-home kit, which customized bleaching trays. We provide the custom-fitting trays, pictured at the left. You then take them home, place bleaching gel inside of them, and wear them to get your teeth as bright as you want. It’s a popular and inexpensive way to a sparkling smile. A. Once you bleach your teeth, they will always be whiter than they were originally. Teeth continue to pick up stains throughout your life, though, so a quick, one-day touch-up every year or two will keep them their maximum whiteness. Q. What about whitening toothpastes? A. In order to be effective, bleaching agents have to soak into your teeth. Toothpaste doesn’t stay on your teeth long enough to affect your teeth internally. Toothpaste removes surface stains, which is nice, but it doesn’t change the color of your teeth. Q. What about other over-the-counter products? A. Some over-the-counter products etch the teeth, which will temporarily make them look whiter, but then they will attract more stain and become even darker than you started, so you have to be careful. Nothing that can be sold over the counter is as strong or as effective as what we can do in the dental office, because the stronger bleaches are only safe to be used under professional guidance. Q. My teeth have dark spots. Will bleaching get rid of the spots? A. We have heard from patients who say their dentist tried to whiten away their spots on their teeth. Dentists who don’t do a lot of cosmetic dentistry sometimes have that misconception. The truth is that teeth bleaching will whiten your teeth uniformly. If you have spots, you will still have the spots after the treatment. They may even be more noticeable because the rest of your tooth is whiter. The way to treat dark spots is with dental bonding.